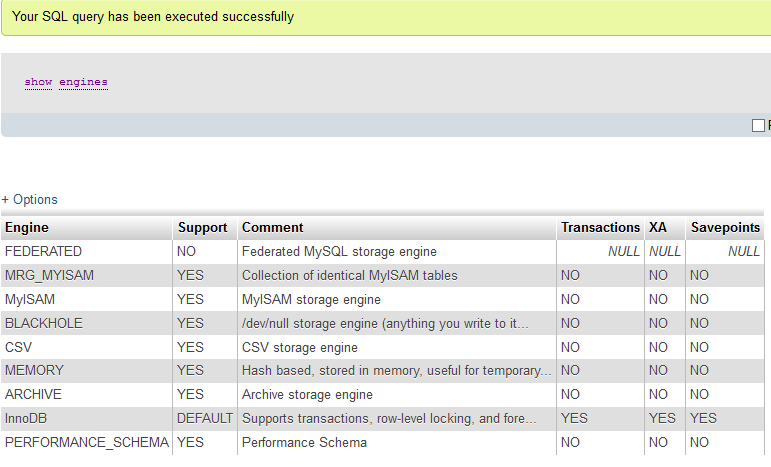 MySQL comes with different level of support for InnoDB Storage engine for every version of its release. The Default configuration settings for InnoDB also varies version wise. So its always a wise decision to ensure that if we are upgrading the MySQL and are having InnoDB as default Storage engine, then it does no harm to revisit the configuration settings. 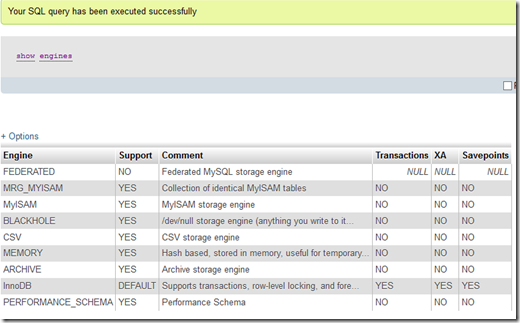 InnoDB is default general purpose storage engine and is recommended for all tables unless you have any special cases. MySQL Server has a pluggable storage engine architecture that enables storage engines to be loaded into and unloaded from a running MySQL server. Row level Locking – blocks reading or writing of table data by connections if another connection is currently using that data. (MyISAM has table level locks) . Acid Compliance – Atomicity means that if a transaction fails then the changes are rolled back and not committed. Consistency means that each successfully executed transaction will move the database ahead in time from one state to the next in a consistent manner without errors or data integrity issues. Isolation means that each transaction will see separate sets of data in time and not conflict with other transactional data access.Durability ensures that any data that has been committed in a successful transaction will be written to disk in its final state, without the risk of data loss from errors or system failure, and will then be available to transactions that come in the future. So chances of transaction corruption is not possible or very small.All transactions are executed in isolations. Referential Integrity – It has ability to store data in multiple tables and maintain referential integrity and data consistency. READ UNCOMMITTED - Every select query operates without locks so you don’t get consistency and might contain dirt reads. So it violates ACID Principles and should never be used if your application issues transactions that require point-in-time consistent data reads. READ COMMITTED – This setting offer consistent reads without table or row locks. Each consistent read, even within the same transaction, sets and reads its own fresh snapshot of point-in-time data.It offers consistency and performance for applications that do not require full ACID.It does not fully comply with ACID. REPEATABLE READ – The InnoDB default isolation level for ACID compliance. SERIALIZABLE: This is the same as REPEATABLE READ but MySQL converts select queries with the preface of LOCK IN SHARED MODE when auto-commit is enabled. If auto-commit is disabled then each select query is started in a separate transaction, which will ensure that all reads are consistent. This setting also allows for XA distributed transactions support, which you can read more about in the MySQL manual.The SERIALIZABLE value setting will impact database transaction execution performance, so only enable this if it is absolutely necessary. One of the hard things of troubleshooting the production issues is to identify the root cause of the issue. When the application is deployed in the open internet and accessed by the variety of the browsers, and has large number of hops in the network, it becomes quite a challenging task. So in this post I will walk you through the list of things which needs to be checked at high level on client side in order to identify the root cause of the issue and before proceeding to do the review of the code base. What is the proxy setting of the browser, does it access the application via proxy or connection is directly to the internet. How is browser configured? Does the user have administrative rights or he has basic rights on the browser settings. In case the issue is related to certificate, then checking whether the relevant certificate is present in trusted store often helps. If your application uses popup windows to display some information, then checking if there are any add on or setting in browsers which is blocking pop ups also helps. Some browser add on silently block pop ups without giving any information to the users. Is the browser setting on default? These are the setting which is factory default. One of the easiest ways to troubleshoot issues is reset the browsers to default setting. Is the client computer behind the firewall? If yes than verifying that it’s correctly configured saves lot of time. Checking the antivirus software installed on the client machine also helps. Sometimes in case where your application uses specials character, there exists a chance that badly configured antivirus might filter out or block the incoming responses. Hardware and software configuration of the user’s machine. In case if your application does lot of heavy lifting on the client side, then it often helps to educate the users that minimum configuration needs to be met. Is the network correctly configured? Using the bidirectional ping command often helps to identify the network issues. Is the client able to resolve the application host name correctly? In increasing user experiences. General Thumb rule I often use is more the hops user does to connect to the server, more the response time he is going to get. Is there any load balancer or firewall between the server and client? If yes than checking if they are correctly configured also helps. Is the user giving the right credentials and if yes then checking if server is doing correct validation of credentials also helps. Is the identity and access validation done by application or by third party component like Site minder? If by third party, then checking the third party component in isolation often helps. Does the user have appropriate access level to access the resources? If yes then further troubleshooting is required. Else its waste of time. If browser is client, then disabling friendly error message settings in browser will reduce the time to identify the issue by almost 50% since no extra debugging tools are required unless the case if of missing or stolen headers.